The Tachibana family had ruled the Yanagawa domain with a territory of 110,000 koku (unit for measuring land), since 1620 when the former lord of the domain, Tachibana Muneshige, came back to Yanagawa and became the lord of the Yanagawa domain again. Since the first Lord Muneshige, the successive lords of the family continued to govern the domain until the Meiji Restoration in 1867. In the Edo period, the family possessed many swords which were all suitable for the status of feudal lords. Today, however, less than only 20 of them remain and are being stored in the Tachibana museum. Each sword holds its own significant meaning and unique story which reflects the family’s history. 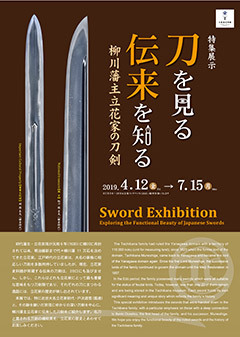 This special exhibition introduces the swords that were handed down in the Tachibana family, with a particular emphasis on those with a deep connection to Bekki Dosetsu, the first head of the family, and his successor, Muneshige. We hope you enjoy the functional beauty of the noted swords and the history of the Tachibana family.